Today, it is my pleasure to introduce you to an incredible woman of God. Her blog was sent to me by a very good friend. The timing of this post that she sent me could not have been more God-breathed. The day that this post was forwarded to me, I was having "one of those days." You know exactly what I mean. I hope this post reaches down deep into your heart and resonates there like it did for me. Be blessed by Candace's post today. You can find more of her inspiring words here. Candace's Intro:My name is Candace Roberts and I am a wife of 14 years and a mother of 3 amazing gifts. There is nothing special about me besides the fact that I am a daughter of the King. My children, however, are something else. My oldest, Jordan, is 12, Nathan is 10, and our little Chinese princess, Katherine Hope is 3. 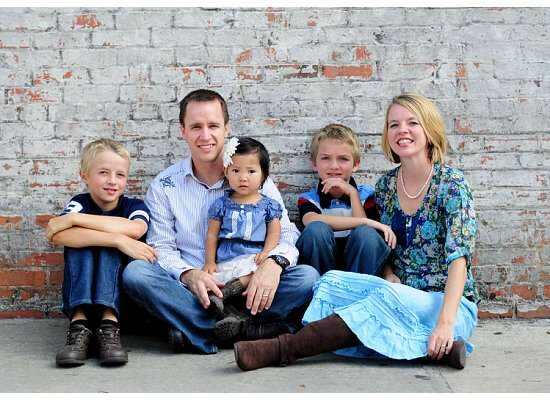 Last year we journeyed to China to bring her home and this year we hope to bring home a sister for her, Naomi Grace. We recently have begun the challenge of schooling at home and though it has taken everything in our heart and soul, it has been the most amazing blessing. I write to open the eyes of the world to the glory of God. Lately, I have felt the weight that comes with the living in a broken world. I find myself yearning to go back to Egypt where my eyes were shut tight and my small world, though without much point, was comfortable enough to keep me hidden. God has done so much with me in the past couple of years. I have changed...my heart has changed...my mind has changed...my life has changed...and just when I think "Surely, He must be done...He HAS to be done" He begins to work again. I used to love to read about the Israelites and their quest for the Promised Land. It always made me feel pretty good about myself (surely I would have never behaved that way! )...until God came for me. Until He called me out of Egypt and set me on a path for the place He created me for. I might have been content to stay safe and comfortable, but He is too faithful of a God to let me waste my life, all the while praying that I wouldn't. It wouldn't be so bad if this were an easy road...the road that leads to your purpose...the road OF your purpose. Jesus looked at His disciples on that road one day and said "Whoever does not eat my flesh and drink my blood has no part in me." and He watched the majority of them turn their backs and walk away. After all, wasn't it enough that they had followed? Wasn't it enough that they had listened? Wasn't it enough that they believed in His work? That they got excited when there was a miracle... that they sat under His teaching? Now He was literally asking them to consume Him... to take Him inside themselves...to become like Him. As His eyes lingered on those who were abandoning Him, He turned to the rest of His disciples, "Don't you want to go too?" And Peter answers with a question that often resonates in my soul and brings me to my knees, "Where would we go, Lord? Only You have the Words of eternal life." I'm NOT going back to Egypt...there is nothing there for me. I have to believe that at some point, every Christian comes to a bend in the road. Before we reach this narrowing of the path, our walk with God has been relatively easy and uneventful. We have watched Him do great things in our own lives and in the lives around us. We have had some good ole' fashioned fellowship with Him. We have been regular church attenders, kept our lives pretty clean, read our Bibles, and sang some great worship songs. And suddenly we face a season in which we feel the stakes raise. He wants more of us. He is not content with our service from Egypt. He is ready to take us further. He is ready to take us into the purpose for which He created us. And we look at that narrowing...we see the bumps... we see the giants... we see the battles that await us, and we have a decision to make. My decision was made, because, like Peter, I knew that there wasn't another option. He was it. He IS it. He is the only thing that keeps me from being a complete and total waste of oxygen. I decided to follow and now my eyes are opening and I do not like what I see... I do not like it one bit. I see a world full of corruption and greed. I see babies being abandoned in streets like trash. I see young people being enslaved to all kinds of demonic powers. I see girls being sold as slaves for their bodies. I see addiction is on the rise and mental illness (much of which is simply a lack of belief in truth) is completely out of control. I see a world of darkness around me...almost everywhere I look. And saddest of all, I see a church asleep...the light of the world dimmed almost to extinguishment...the city set on a hill that cannot be hidden, broken down and dilaphidated. Its members content to love the world, live like the world, and defend the world, all while trying their best to have an appearance of Jesus. The command to "go into all the world and preach..." nearly forgotten and left to a remnant of people usually labeled "uptight Jesus freaks"...as in "you are taking this Jesus thing entirely too seriously. Lighten up. Have some fun. Joy. Grace. Fun. That's what Jesus is. "And this is hard. It is hard to live every day with this knowledge...with eyes wide opened...and the heart of Jesus within you that longs to fix it. Yet in all this brokenness...all this hardness...all this emptiness... He gives hope. We have hope because God used 2 out of 12 to eventually lead His people into the Promised Land. We have hope because God used 11 out of hundreds to begin His Church that the gates of hell, no matter how hard they rage today, have NOT prevailed against. We have hope because God is well able to use the remnant of His people...the ones who will follow Him past the bend in the road and into the difficulties and sufferings of bringing light into the darkness. We have hope that God has done and will do the impossible. Can I tell you that you ARE the hope? Will you let Him open your eyes to a world that is crying out for you? Will you do SOMETHING in a world where doing nothing is the norm? Will you stop complaining and start asking Him where you fit into the solution? What are you created for? Don't waste your life away in Egypt...there is nothing for you there...YOU are the light of the world. Be the Light.